The practice of cosmetic surgery has made huge strides over the past decade, allowing surgeons to provide more natural, aesthetically-pleasing, and elegant results than ever before. However, no matter how advanced the technology or how sophisticated the surgical techniques may become, nothing can replace the artistic eye and skill of a talented facial plastic surgeon. Simply put, not all surgeons are created equal. This is rarely more apparent than in the case of rhinoplasty (commonly known as a “nose job”). The nose is one of the most visible features on your face, as immediately noticeable as your eyes and smile. And while you want to choose a surgeon who will provide you with a safe procedure with as little downtime as possible, it’s also of utmost importance that you choose a surgeon with the experience, artistic ability and knowledge of the anatomy of the nose to create a truly beautiful result. Some surgeons may be skilled at other cosmetic procedures but lack the training and experience to perform outstanding facial surgery. Prior to your surgery is the time to find that out! When choosing a surgeon for your rhinoplasty, it’s important to do your research. If you know anyone who has had a good rhinoplasty, ask them about their procedure and their experience with that surgeon. Read reviews and ask questions. Many surgeons will provide a free consultation, which gives you a chance to meet the doctor in advance and assess your comfort level with him or her. Never choose a surgeon who you feel intimidated by—if you’re afraid to ask questions or communicate clearly, your experience will be negatively impacted. You can usually learn about a potential surgeon’s education, training, and board certifications online. If your surgeon does not have a web presence of some form, this may be a red flag. Ideally, you should choose a surgeon who is certified by the American Board of Facial and Plastic and Reconstructive Surgery. Surgeons who have these certifications have had to undergo extensive specialized training and are truly committed to the field of facial plastic surgery. Your surgeon should be able to provide you with this number—and a good one will have done hundreds, if not thousands, during the course of his career. As with anything, the more times you do something, the better you get. Choose a surgeon who has the “numbers” to have developed advanced technique and expertise if you want to increase your chances of having a beautiful outcome. May I see your before and after photo gallery? This is a reasonable and common request. Make sure your surgeon provides you with pictures of patients he has actually operated on, and not stock photos. This will help you to understand the surgeon’s capabilities. 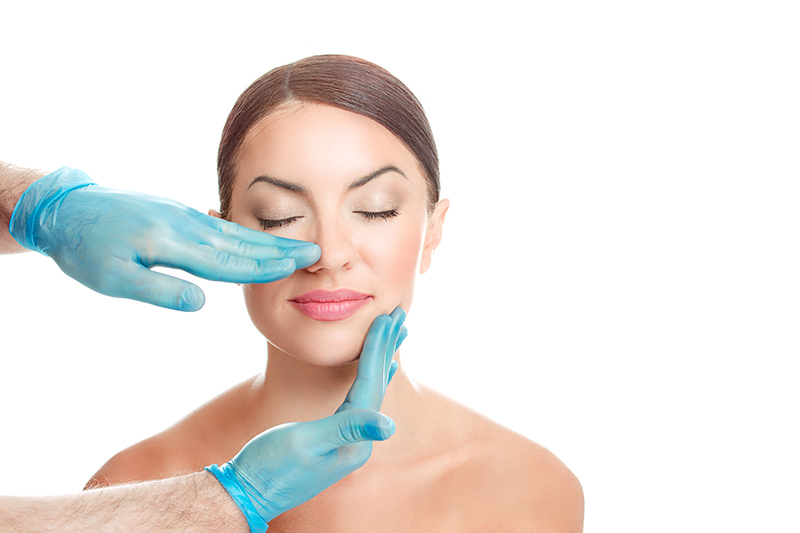 May I see some testimonials or references from your previous rhinoplasty patients regarding their results? Reputable surgeons should be able to easily produce several patient statements from satisfied rhinoplasty patients, as well as the before and after photos to go with them. If a surgeon isn’t willing to provide these, it may be that he just doesn’t have them. Can you make my nose look like a particular famous person? If you have a celebrity “nose crush,” make sure to ask the surgeon about the possibility of reshaping your nose to imitate the nose of your dreams. Beware a surgeon who promises you he can make your nose exactly like someone else’s. Unless your nose has the identical structure of your goal nose, and your face the exact same shape and bone structure, it may not be feasible or even desirable to give you an exact copy. A trustworthy surgeon will discuss the features of your desired nose with you and come up with a plan that makes you happy, while keeping expectations realistic. You will probably find the cost of rhinoplasty to be fairly consistent over a geographical area, provided you are choosing surgeons with similar levels of expertise. If you find a surgeon who quotes you a price that is drastically less than others you have seen, you need to think carefully about choosing this surgeon. As with everything in life, “you get what you pay for,” and a rhinoplasty procedure is not where you want to find a rock-bottom price. A new, beautiful nose frequently gives patients greatly increased levels of self-confidence, and a new, poorly-done nose can do just the opposite. Remember, you’re not saving any money if you have to pay another surgeon to fix it later. If you’re interested in a rhinoplasty, please contact our cosmetic surgeon at New Look New Life Surgical Arts in Manhattan at (855) 361-8492, Brooklyn at (855) 531-0876, or Westchester at (855) 299-7046 to schedule your rhinoplasty consultation. New Look New Life Surgical Arts serves clients in surrounding areas of New York City.